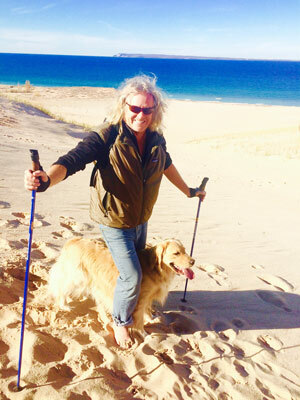 Meet Pete Edwards, the Owner, Founder and Head Coach of SKIWALKING.COM LLC and The American Nordic Walking System. World Headquarters is located near the Sleeping Bear Dunes – a fun and ideal testing ground for our#1 rated poles. I love the outdoors. Hiking, running and skiing with my family has always been #1 on my personal fun factor. When my kids were little, they traveled in a backpack during hikes, were pushed in the jogging stroller on long runs and pulled in the pulk-sled while we cross-country skied. And now, thanks to the hottest fitness activity to ever hit Europe, my #1 outdoor activity is NORDIC WALKING. I look forward to Nordic Walking, Nordic Running, Nordic Roller Skiing or Cross Country Skiing (Nordic Skiing) every night after work – all with quality one-piece poles that prove to be safer, lighter, stronger and much more user-friendly than the cheap/flimsy collapsible poles currently flooding the market (most made in China and destined for the landfill). It has always been obvious to me that quality one-piece poles are the only option for the sports I LOVE – Nordic walking, Nordic running, Nordic skiing (cross-country skiing, Nordic roller skiing, hiking, trekking, Nordic snowshoeing, alpine skiing (downhill skiing) and tele (telemark) skiing. ALL of these activities destroy cheap/flimsy 2-piece and 3-piece collapsible poles – proving that one-piece poles are superior. The durability and dependability of one-piece walking poles make them the safest choice for seniors or individuals with balance issues. My oldest daughter is an Outward Bound Instructor and Wilderness Guide. She has seen first hand while guiding in the mountains that one-piece poles that are sized correctly are far superior to cheap/flimsy 2-piece and 3-piece twist-lock and flip-lock collapsible poles that tend to rattle, vibrate, collapse unexpectedly, refuse to stay locked into position, or freeze up and won’t adjust. Thousands of backpackers have tumbled when their collapsible poles failed unexpectedly. My youngest daughter is a Junior Olympic National Champion and was captain of her Middlebury College Ski Team. Her college ski coach had her doing 3 hour Ski Walks during the off-season, and I was always thrilled to tag along when she was home over the summer. We are skiers and skiers know that one-piece poles are safer, lighter and much more durable than cheap/flimsy 2-piece and 3-piece twist-lock and flip-lock collapsible poles. Our one-piece poles also prove to be superior when it comes to other walking and trekking poles – superior in the city, out in the country, on the beach, up on the sand dunes and up in the mountains. I am a former marathon runner, and Nordic Walking saved the day for me after a running injury ended my running career. As a running coach and ski coach, I incorporated Nordic Walking and Nordic Running into many of my workout plans. For athletes with minor aches, pains and pulls, their entire workout may involve Nordic Walking exclusively due to the impressive aerobic benefits and yet minimal impact on these athletes’ joints, shins, and typical sore spots. Athletes with runner’s knee and/or killer shin splints can comfortably Nordic Ski Walk with poles for hours – the poles absorb the shock, stress, and pounding. 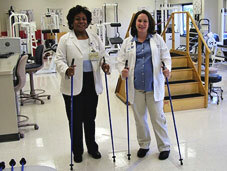 Individuals with knee, hip and/or back problems LOVE my Nordic Walking poles too. It was by accident that I found out how wonderful the correct length poles are for anyone with balance, stability and gait issues -including MS, Parkinson’s, Neuropathy and Arthritis. I totally enjoy hosting free Nordic Walking clinics for Multiple Sclerosis (MS), Parkinson’s (PD), Diabetes and Cardiac Rehabilitation Support Groups, plus Wounded Warrior Programs. We also donate our quality one-piece poles to Wounded Warrior Programs at Walter Reed, Fort Carson, Fort Lewis/Madigan/McChord, and Vicenza, Italy. For 40 years I have coached runners and skiers including numerous All-State and All-American athletes, plus an occasional Jr. National champion. I have found that Nordic Ski Walking can benefit ALL my athletes as they pursue new personal records and their poles provide them with a FUN, low impact way to improve their aerobic capacity, regardless of their fitness level. Fans of SkiWalking.com’s SWIX and EXEL fitness walking poles include individuals from 4 years old to 100-year-old great great grandparents. I have hosted hundreds of Nordic Ski Walking Clinics from California’s Lake Tahoe to the Green Mountains of Vermont. Everyone in my clinics has loved the way the poles automatically encourage us to walk taller, with a super straight back, the way the arms are so actively engaged and how the pounding/stress to the shins, knees, hips, and back is radically reduced. Nordic Walking is FUN, and over 12 million Europeans can’t be wrong! Discover the low impact, high-calorie burn and aerobic benefits of Nordic Ski Walking for yourself, family and friends. I hope to see you soon out on the trails, in town, on the beach or on the track!